There is no doubt the young man enjoyed each cruise and would go again. Each line has a professional kids department, dedicated to children from six months to 17 years of age. On American ships no alcoholic beverage can be purchased until 21. With NCL & P&O the day is divided into three sessions, morning afternoon and evening, with a staff rest period in between. For RCCL it is straight through. The cut-off age differs slightly with each company but generally from 13 upwards the youngsters can come and go as they please. From a parent’s point of view the check-in for each session with P&O was manual, making it hard work, and one had to take out one’s charge each time feeding was needed. Likewise with Norwegian Cruise Line but at least the key card could be used and no paperwork. With RCCL the eating was easy, food available any time via what is in essence an extension of cabin service. With all the lines the kids' facility was available from dawn to past dusk (the hard working staff rostered for duty). We asked our charge which was best. In his view the shows were best on Epic, the organisation of goings-on unsurpassed with Ventura, and now past the age when he did not require to be supervised the whole time, the sheer range of activities with Explorer of the Seas. This year there was no flying just a simple drive to Southampton, unloading by the porters at the terminal, easy parking, and with reception staff poised to help very quick boarding. The handling agents have to be praised with the way they do things, but if you are travelling with a child of under 18 who is not yours do make sure that you have the correct legal documentation to take the youngster aboard. The law of the land does not seem to apply. Each cruise line operates under its own ideas. One tip we have learnt from the three cruises. If you are on holiday making three up with a youngster pay a little more and go for a larger cabin. And check carefully that your accommodation does not offer awkward bunk accommodation for the third person. 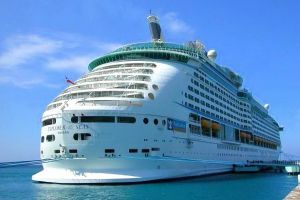 Business Travel News took a look at Explorer of the Seas 1 June. The ship this time around was completely full well over 3,500 passengers including the younger element accommodated with their minders, parents or otherwise. Everything worked very well including the ice skating, the brand new FlowRider and the rock climbing. The two main swimming pools were kept very busy, whilst adults were free to use a third pool in an area banned for children. We chose ‘My Time Dining’ which worked very well, sometimes two of us, and occasionally three, and usually at about the same time with the same table and serving people. What was particularly outstanding was the friendly attitude of all the staff, outstanding, particularly for such a large ship. Yes the service desk did have long queues at certain times but the trick was to choose a visit when it was not busy. On our preview visit we had sampled Giovanni’s Table, a traditional trattoria, Chops Grill steak house and Izumi Japanese cuisine. We did the same again. Very good and fair value. Two innovations stood out. One the culmination of modern technology and the other so simple that other ships ought to copy. Unless you are completely daft it is impossible to get lost on the massive Explorer of the Seas. At every sensible point a large touch screen (Wayfinder) is provided, a menu for the ship. If you want to know where you are, how to get to your stateroom, find out what activities are on at that time, and the current dining menus. All the information is provided. And more. It’s been rolled out on all the RCCL ships. The other novelty is a simple notice pin-board. You want to meet someone interested in say Italian Art, or organising a card school. Just leave a message. A very simple innovation but people were looking all the time. Including the crew there were close to 5,000 souls on board Explorer for our 14-night trip. Our 14 nights included Gibraltar, Villefranche, Civitavecchia, Livorno, Marseilles, Malaga and Lisbon as ports of call. Plenty of sea days too. Our charge for the most part stayed on board, his guardians happy in the knowledge that the electronic key card would not allow him off the ship without us. For the most part on this trip we tried self-conducted tours, certainly cheaper than the ship’s excursions, with no guarantee of getting back in time to make the ship’s departure. But we did not hear of anyone being left behind. Gibraltar is a British Overseas Territory and has been since 1704. From time to time Spain makes noises about taking it over and life becomes less easy for the 30,000 inhabitants but 6,000 cross from the EU for work every day. Sadly Explorer, like most cruise ships only docked for less than six hours, just time enough to take the cable car to the top of the Rock and play with the monkeys. From the port you can walk into Town Square and soak up the very British atmosphere and use the Queen’s coinage. www.visitgibraltar.gi Also see BTN 10 August and 20 July. The port of Rome has a direct rail service to both Vatican City station (55 mins) and Rome Termini (75 mins). It is normally reliable and if you are unescorted usually quicker and more comfortable than a bus. The only problem is that the port area has been renovated and while a free transfer service is provided to the gate you then have to take another bus, or taxi to the station. It is not far but it is a good walk.